Giancarlo Cruz Michael Stanton is an American professional baseball right fielder for the Miami Marlins of Major League Baseball. Prior to the 2012 season, he was known as "Mike" Stanton. He graduated from Notre Dame High School, before he was drafted by the Marlins in the 2007 MLB Draft. 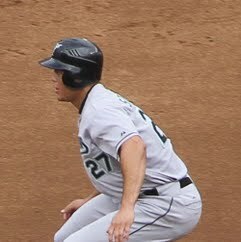 He first appeared for the Marlins in the middle of the 2010 season. Stanton was selected to the Major League Baseball All-Star Game in 2012, 2014, and 2015. In November 2014, the Marlins signed Stanton to the richest contract in sports history, worth $325 million over 13 years.